While in in Washington, DC, recently for a meeting near Capitol Hill, we were able to shed the discussion of sequestration and enjoy a relaxing meal at Charlie Palmer Steak. Charlie Palmer's is one of the top restaurants in DC and has a unique focus for their wine list. The wine list features only American wines and, in fact, they will wave corkage on up to two American wines depending on the night. I had thought about packing a couple of bottles to bring with me, but decided against it to avoid checking a bag. With the Capitol dome in the background, our group of four settled in and I scanned the wine list. 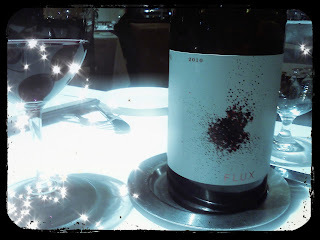 After a discussion with the sommelier I selected the 2010 Flux blend from California. The wine is 67% Grenache, 20% Carignan and 13% Syrah. It is a project of Mark Herold, a top winemaker with a focus on limited production California Cabs. When he left his most recent winery, a non-compete clause prevented him from making Cabernet Sauvignon -- so he shifted his focus to Rhone-style wines. This is a dark and smooth wine with medium body. It has plush flavors of cranberries and dark cherry with wisps of black pepper and tea. It is a vibrant wine with the soft Grenache benefiting from the earthiness of the Syrah. It was a great match for the shrimp appetizer and my roasted veal shank entree. It's a beautiful bottle and can be had for about $30 retail. At the restaurant it was $75.